C.O.D Digestion Apparatus is used to determine the chemical oxygen demand. 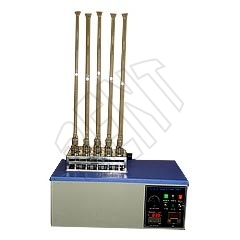 We are one of the leading manufacturers and suppliers of C.O.D Digestion Apparatus. Our specially manufactured C.O.D Digesters are in great demand owing to its excellent quality and good functioning. Fitted with a digital temperature controller having a timer for 2 hours and also a buzzer. Consists of a reaction vessel of 38-40mm. Supplied with 15 nos. glass reaction vessels. Supplied complete with a stand which can accommodate 15 vessels. Can be operated on 230 volts, 50 Hz, and Single phase.